since we had an abundance of apples from our apple picking adventure on saturday, we decided to make an apple cake for leko's birthday party this past weekend. the perfect dessert for fall. 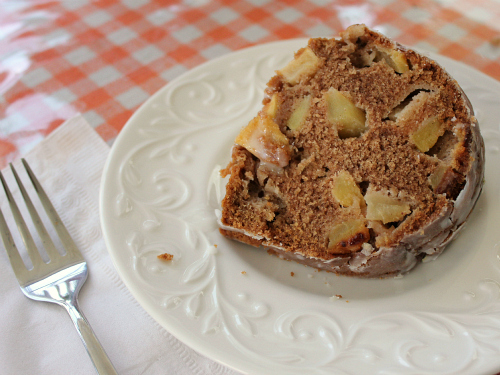 this cake is chock full of apples. you could use just one type of apple for this recipe, but i recommend using several different types. it will lead to some amazing flavors. something magical happens when this cake bakes. if there are any apples that are touching the outer edges of the bundt pan, the sugars in the apples caramelize as the apples bake. the result is absolute deliciousness. the glaze that is drizzled over the top of this cake adds just the right amount of sweetness too. if you're not into the fall spirit yet, this cake is sure to put you in the mood for cozy sweaters, falling leaves, and crisp autumn air! 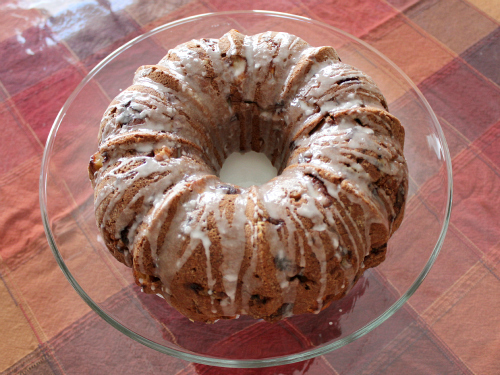 preheat your oven to 350 degrees F. grease and flour a 10-inch bundt pan, then set aside. in the bowl of an electric mixer, cream the butter, oil, sugars, and vanilla together until light and fluffy (about 2-3 minutes). add in the eggs one at a time, beating well after each addition. add half of the flour to the batter and beat until combined. add in the remainder of the flour along with the cinnamon and baking soda, beat until incorporated. peel and core the apples, then dice them into small cubes. 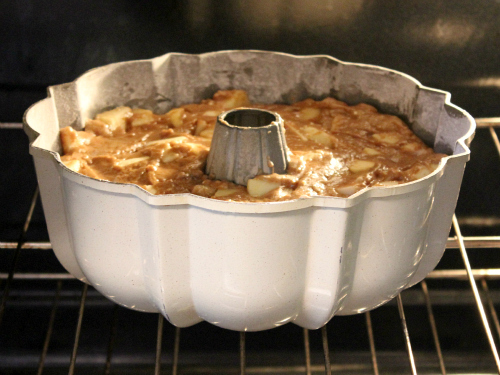 gently fold the apples into the batter. 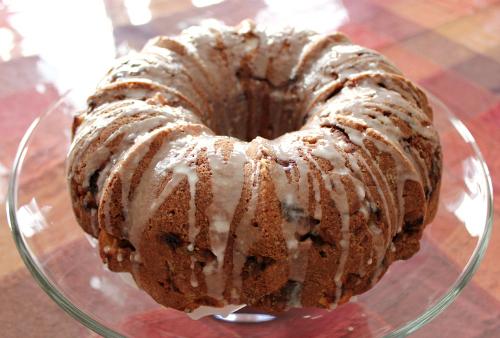 evenly distribute the batter in the bundt pan and bake for 1 hour 10 minutes, or until a knife inserted into the center of the cake comes out clean. once done, allow the cake to cool in the pan for 15 minutes. remove the cake from the pan and allow it to cool completely on a wire rack. to make the glaze, whisk together the powdered sugar and milk in a small bowl. 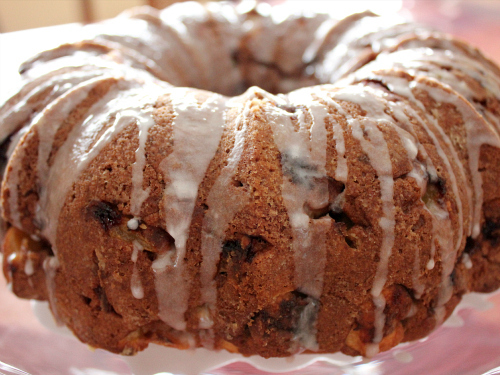 when the cake has completely cooled, drizzle the glaze over the cake. The cake looks delicious! But I have to figure out how to print out the recipe. I will add this to my list of apple recipes to try after I pick apples this weekend. I hope mine will look as delish as yours!